This hand cut sterling silver horse pendant is modeled after the Native American horse symbol. 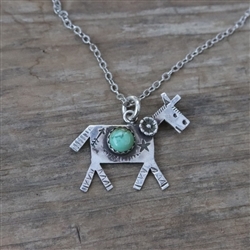 He is adorned with southwestern stamping, a lovely 6mm turquoise dot, and a small sterling flower. 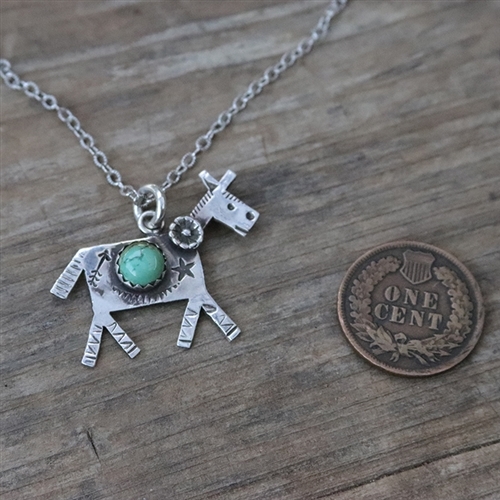 From ears to hooves, the pendant is 7/8" tall. From nose to tail, it is 1 1/8" wide. ***These are handmade, so slight variations may occur, but overall design will be evident. Also, no two pieces of turquoise are the same. There will be variations in shade and matrix.